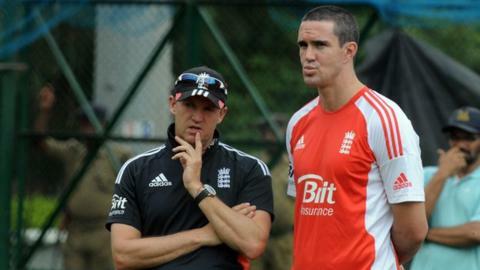 Former England batsman Paul Collingwood says he trusts team director Andy Flower to make the right decision over whether to recall Kevin Pietersen. "Flower is not scared of making strong decisions and he is the right person to do it," Collingwood told BBC Sport. "He will know what effect it will have, whether it is detrimental or not." Pietersen, 32, was dropped for the third Test against South Africa for sending text messages to rival players allegedly criticising team-mates. He subsequently issued a public apology after admitting sending "provocative" texts, before dismissing them as "banter". Pietersen spoke to Andrew Strauss before and after his resignation as Test captain last week and held talks with Flower on Saturday. August 2009: Picks Jonathan Trott ahead of Mark Ramprakash for final Ashes Test. Trott scores 119 as England win series. January 2011: Drops Samit Patel from World Cup squad for being overweight. July 2011: Keeps faith with struggling Stuart Broad for India series and is rewarded as the bowler takes 13 wickets in first two Tests. June 2012: Rests fast bowlers James Anderson and Broad for third Test against West Indies at Edgbaston. August 2012: Leaves out spinner Graeme Swann for Headingley Test against South Africa. Pietersen has been left out of England's squad for the South Africa limited-overs series and the World Twenty20 later in September but could return for the November tour of India, with the squad to be named in early October. Collingwood said the Zimbabwean Flower will need to consider whether recalling a talented but unpopular player could disrupt dressing-room harmony and have a negative effect on the team's performance. "Since Flower has come in whatever decision he has made has been for the best interests of the England cricket team," said Collingwood, who played alongside Pietersen for England between 2005 and 2011. "He decided at Lord's it was in the best interests of the team for him not to be in there. "I've had a couple of discussions [with England players] but you don't know until you are in the dressing room what the atmosphere is like. "There is certainly a possibility that if he says and does the right things he can drag the situation back. It's not necessarily the end of his career." Pietersen has scored 7,076 Test runs at an average of 49.48 and, with 88 caps, is more experienced than any member of the England squad. Durham captain Collingwood expects the debate over Pietersen's place in the side to continue even if he is left out of the India tour. "The problem is that it's never going to go away," he said. "He's always going to be scoring runs in county cricket and knocking on the door. "There will always be two opinions over whether he should be playing."